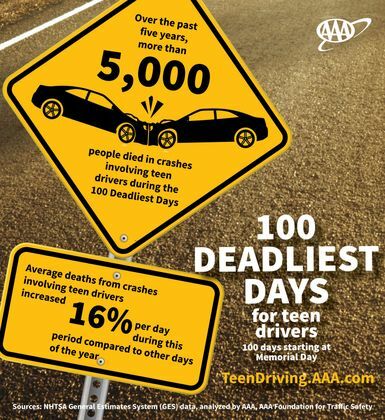 VIRGINIA BEACH, VA. (June 1, 2016)- Over the past five years, more than 5,000 people have been killed in crashes involving teen drivers the “100 Deadliest Days,” the period starting Memorial Day when teen crash deaths historically climb. As the summer driving season begins, the AAA Foundation for Traffic Safety is releasing a follow-up study confirming that nearly 60 percent of teen crashes involve distractions behind the wheel. The research also finds a disturbing trend showing that texting and social media use are on the rise amongst teen drivers. Across Virginia in 2015 there were 5,180 crashes involving teen drivers during the 100 days of the summer. As a result of those crashes, 1,189 teen drivers were injured and 14 were killed. Compared to the rest of last year, the summer months represented 41 percent of the fatalities for teen drivers. These same summertime crashes across the Commonwealth resulted in an additional 1,808 injuries and five fatalities to people other than the teen driver. by Pew Research Center, which shows text messaging has become a key component in day-to-day interactions amongst teenagers. Fifty-five percent of teens spend time every day texting, sending an estimated 80 text messages per day. AAA Tidewater Virginia offers a free 90 minute Dare to Prepare Workshop for teens and parents. It is a pre-permit workshop that provides teens and parents with more tools and resources to educate them about the GDL process, current laws involving the new driver, and tips on how to stay safe on the road. For more information or to register please call 757-233-3889.